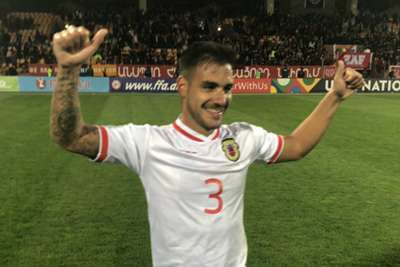 Critics of the Nations League should consider that nations like Gibraltar have a chance to make history in the competition, says the team's striker Reece Styche. Gibraltar earned their first ever competitive win with a 1-0 win away to Armenia before following up that victory by coming from behind to beat Liechtenstein 2-1 in League D Group 4. Liverpool manager Jurgen Klopp described the Nations League as "the most senseless competition in the world" after a 0-0 draw with Manchester City earlier this month. But Darlington attacker Styche stressed the importance of the Nations League to Gibraltar, who were recognised by UEFA as an affiliate in 2013. "Unfortunately this is the mentality of big clubs and big managers - like Klopp's comments that this is a meaningless competition - it's not," Styche said in an interview with Omnisport. "Meaningless is friendlies where players are being pulled out with injuries. "We're competing and for us, as a nation, to not go into games expecting to get hammered, you know you can compete. We're learning as a nation from the experience and from the winning feeling. I don't know how anyone can say it's a meaningless competition. "It's doing what UEFA thought it would, providing competitive games for every nation involved. For us, we're part of history and if you asked 32,000 Gibraltarian people if this competition is meaningless then you'll get a stern 'no'. It shows we're competing and that's what it's aimed to do." Arsenal midfielder Henrikh Mkhitaryan started for Armenia but a second-half penalty scored by Joseph Chipolina got Gibraltar their maiden win. "You can't put into words how it feels that you've gone away with one of the smallest nations in the Euro structure and come away with two wins. No one would have expected us to come away with that," Styche continued. "It's a feeling of overwhelming joy with the accomplishment we've done and the togetherness in the team, it's just amazing, it's hard to put it into words really. "It's not just the fact we've made history, but we made history away from home. To go to someone else's country and play on their turf, I think there were 11,000 fans there. "You're playing against Mkhitaryan and these lads who are good players and the majority of our lads are semi-professional. So to come away with a win and be part of history, it can never be taken away from you and it's the best feeling really." Successive wins have left Gibraltar three points behind group leaders Macedonia, who they face in the second of November's double-header after a home game with Armenia, and Styche said promotion into the third tier of the Nations League is in their sights. "People look at it and say we're the next San Marino - we're not, we're Gibraltar," Styche said. "Would San Marino go and get the two results we just have? It puts us in our own bracket that we're there to compete, not just make up numbers. "Was it realistic that we could have got back-to-back wins? Possibly not. But why can't it be realistic to get promoted? We've beaten Armenia once so we can beat them again. Armenia beat Macedonia 4-0 just before our game so who says we can't go and beat them? "If we do, it would be astronomical, not just for us but football in general. Imagine if we qualified out of a group where we weren't meant to even get a point. "We genuinely believe we can win after those last two results and we believe we can get promoted. If we do, it'll be unbelievable. It would be one of the best achievements for a footballing country in the last 20, 30, 40 years."